Ex-West Brom striker Brown Ideye scored his first goal for new club Tianjin Teda in their 3-1 win over Yanbian Fude at the Olympic Stadium on Saturday. Before today's encounter, the Nigeria international had played four games in the Chinese Super League without finding the back of the net. Ideye's dry spell which stood at 341 minutes ended when he registered his name on the scorecard in the 72nd minute to give Tianjin Teda a three-goal cushion. 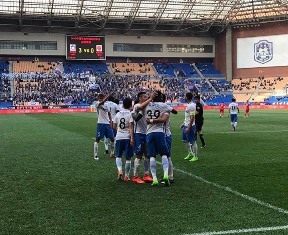 Goalkeeper Wenyi Chi had parried Mbaye Diagne's effort into his path before the Nigerian tapped the ball in from close range. Ideye's last goal prior to his switch to China was scored in the colors of Olympiakos in their 2-0 win over AE Larisa on February 11.